The wildlife management programs on South Carolina's military bases are a win-win - providing improved habitat for a wide range of species while creating a more effective training environment for our soldiers. Wildlife manager Doug Morrow stands among century-old longleaf pines explaining why the Southeastern kestrel - a subspecies of the American kestrel - prefers mature, open pine woodlands. Without breaking stride, he bends over a tubular plant known regionally as frog's britches, describing how it digests insects. It's evident that he's right at home here in the sandy hills east of Columbia, yet Morrow is standing smack dab in the middle of an army base on a tract of forest land adjacent to an active firing range. Morrow's in charge of wildlife and habitat conservation efforts for the Environmental Division at the U.S. Army's Fort Jackson training facility. Although a civilian employee, Morrow's rapid fire of acronyms - DOD, RCW, ESA, DNR, MAPS - provides unmistakable evidence of the military influence that's governed his twenty-five years on base, where he also shares the Army's primary mission: training soldiers to fight and win wars. 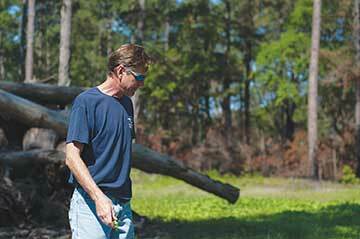 Along with Morrow, a cadre of specialists at military installations across the state - Fort Jackson, Shaw Air Force Base, the Marine Corps Recruit Depot at Parris Island and others - are waging war against habitat loss and species extinction. And while that may seem an incompatible task with training soldiers for battle, it definitely is not. In fact, by restoring and improving wildlife habitat across thousands of acres administered by the U.S. Department of Defense in South Carolina, these military wildlife managers are also creating better places for soldiers to learn key fighting skills. 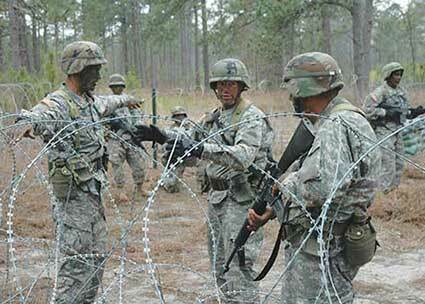 The Defense Department manages 28 million acres nationwide, including the 52,000 acres encompassed by Fort Jackson. Established in 1917, "Camp Jackson," as it was initially called, was just a set of tents used to house recruits on their way to the First World War. The facility grew, like many others around the U.S., as a second war in Europe loomed. An unintended consequence of all that land acquisition by the military, says Morrow, was the creation of the nation's first wildlife preserves. "The military was out to train their folks, but they also created an oasis [of undeveloped land] for indigenous species that has been around much longer than many refuges and national parks. It kind of came second hand," he explains, pointing out that the biodiversity and density of rare and endangered species are especially healthy on military bases. In fact, the Defense Department now manages more than 420 federally-listed species on its bases across the U.S. The military may have started out as reluctant conservation managers, but they are now as unrelenting and devoted to that task as they are on the battlefield. Among military bases nationwide, some 340 have natural resources significant enough to require active resource management plans. "I feel like the rewards of conserving wildlife are better known, understood and accepted today than they were twenty years ago," says Fort Jackson Garrison Commander Michael Graese. Graese will tell you that not only has the work created better training conditions for soldiers, but protecting natural resources has also improved the quality of life for installation personnel and the public. 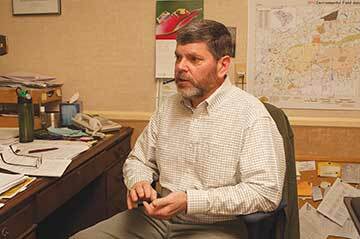 Morrow, too, has seen a change in attitude during his nearly three decades working on base. And while it may be hard to imagine how protecting wildlife can help protect us from enemies, he has no doubts about the strategic value of their conservation efforts. "They may kid us about our birds," Morrow jokes, "but there aren't many large tracts of land sitting out there vacant waiting for the armed service to go out and train on. This is what we've got, and we have to take care of it." The federal Sikes Act of 1960 required the Defense Department to implement and develop integrated natural resources management plans at military installations in the U.S. "Essentially it gave us the authority to manage those resources," says Morrow. The act resulted in partnerships between the military and conservationists to maintain habitat for threatened species, and nowhere has that legislation been more effective than in the ongoing effort to protect one of the Southeast's most vulnerable species, the red-cockaded woodpecker. Working in cooperation with the U.S. Fish and Wildlife Service and with state wildlife managers, the Army's highly successful effort to manage and study RCW populations on bases in the Southeast has been lauded as a model wildlife conservation program. Although still federally endangered, RCW populations are making significant strides across the region. It is one of the biggest conservation success stories so far in the military's wildlife management efforts. "The RCW program is something we like to brag about," says Morrow. Despite these successes, Morrow and his colleagues, such as Bryan Hall, conservation manager for the S.C. Army National Guard, have to stay on alert for species that may be watch-listed in the future. Hall manages wildlife habitat conservation at the McGrady National Guard Training Center, which occupies the eastern third of Fort Jackson, and at the McEntire Joint National Guard Base in Richland County, as well as natural and cultural resources at eighty armories across the state. For the past twelve years, Hall has partnered with the S.C. Department of Natural Resources to conduct annual Monitoring Avian Productivity and Survivorship (MAPS) surveys to characterize on-base populations of migratory birds. The work involves netting and banding birds to develop a species database. Recently, Hall began monitoring bat populations, looking for signs of the deadly white-nose syndrome. "Part of that protects our base's training mission, but it's also good management; it is the right thing to do," says Hall. "If they can't train, then we aren't doing our job." Other South Carolina bases have also had success managing at-risk species and improving habitat. Working in cooperation with researchers at the University of South Carolina and the DNR, John Holloway, natural resource manager at Parris Island Marine Corps Recruit Depot, has studied the base's Eastern diamondback rattlesnake population to reduce potentially lethal human interactions with the venomous snake. The results of the study suggest the base has a sustainable population. Good news, since this species' numbers are in decline. 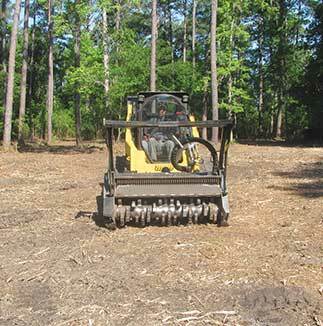 Holloway's team also participates in MAPS and monitors nesting ospreys and bald eagles on the island, and the ongoing timber management program at Parris Island has increased available habitat for a wide range of native species. As at Ft. Jackson, these efforts have provided better areas for basic training procedures, such as land navigation and orienteering. 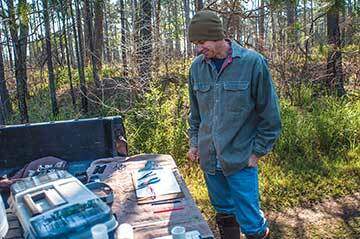 The focus at Shaw Air Force Base is squarely on managing entire ecosystems, explains Ronald June, the natural and cultural resource manager at the base near Sumter. June manages a crew of seven that's responsible for more than 15,000 acres of land. 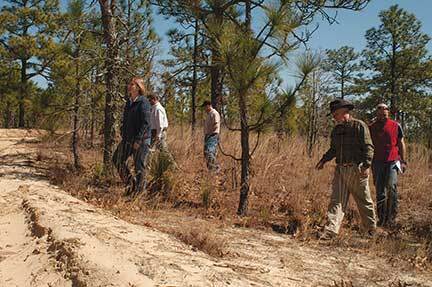 In 2004, they launched a project to restore one of the Southeast's largest stands of rare Atlantic white cedar trees, besieged by other, more aggressive species. 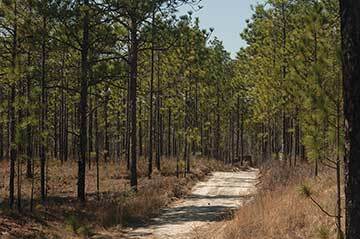 They've also made steady improvements to the longleaf pine forests on base that are essential to the well-being of the red-cockaded woodpecker. In fact, much of the wildlife management effort at all of these bases revolves around timber management, and for some of these on-base managers, fire has become one of their most effective weapons. "Getting fire back on the landscape has been one of our biggest challenges," says Morrow. When he first began working at Fort Jackson, there were large sections of forest that were overgrown due to the lack of naturally occurring fire on the landscape. In some areas, forests near artillery ranges had been maintained by errant shells, but in more remote parts of the base, Morrow can point to places in which fire has been kept off the land for decades. Driving down one of the base's roads the contrast is obvious - on one side the undergrowth is a tangle of bushes, fallen trees and thickets of saplings as impenetrable as barbed wire. On the other, a section managed by fire is park-like, with a grassy understory and wide openings among mixed-aged trees and small hardwoods. That's one thing migratory birds and the military have in common, says Morrow, a preference for forests with natural openings and undergrowth that's manageable. For training soldiers, open forests are the preferred environment for easy maneuverability and a good line of sight to aid in instruction. It also brings the forest closer to its natural state in which fires played a critical role. 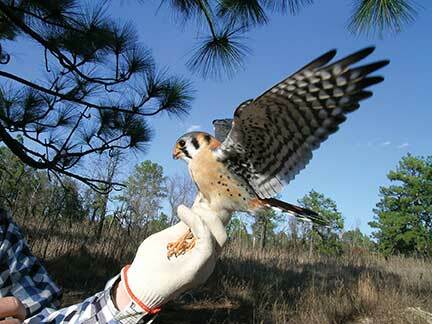 Birds like the Southeastern kestrel prefer open forests to forage for insects and other small critters. Yet the expanded use of prescribed fire has amplified one of the military's biggest challenges when it comes to executing their training mission on military bases: the steady march of development along their perimeters. It's not the military that has an issue with prescribed fire, sometimes it's their civilian neighbors. That's just one of an array of challenges, including tighter budgets, climate change, invasive plants and ensuring that training goals take precedence that Morrow and his fellow military wildlife managers must face. Luckily, these professional wildlife managers are up to the task, and the military's stewardship of its lands fits very well with the ethos of American conservation. "As a nation, we've placed a high value on our resources," says Morrow. "It's what built this nation." Clemson University graduate Jack Igelman lives in Asheville, North Carolina.